Yesterday, Sunday 27 April 2014, two popes made history together, being canonised together. A lot has been written about Pope John XXIII and Pope John Paul II, and so this post focuses on Pope Francis, and specifically about a photo he took in August last year. Actually, here is a picture of the picture being taken. Let me start by re-stating that I feel that every photo has “multi-dimensional space”, and that photos freeze a moment in time, but not what was happening. What was happening is a whole different thing, very different for every person in that moment, and also possibly many different things for each of them. All of this allows for perspectives which may be disentangled by you and me, the picture’s viewers. 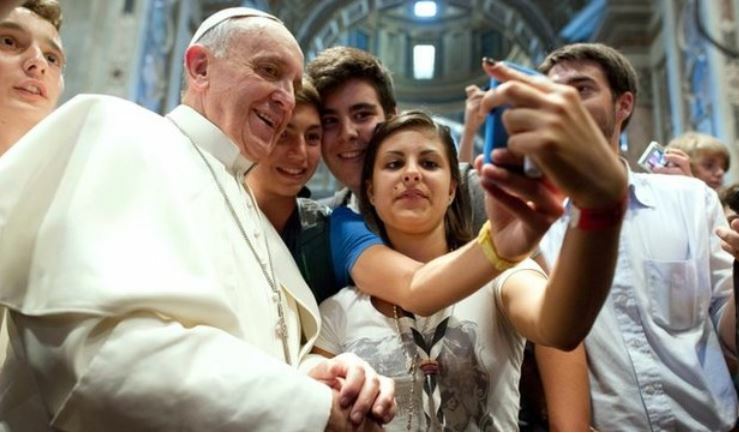 The word selfie was Oxford dictionary’s word of the year in 2013, defined as “a photograph that one has taken of oneself” and so, strictly speaking the picture of the pope is not a selfie. Because he did not take it. But maybe it qualifies because he actively participated in it (posed for it). 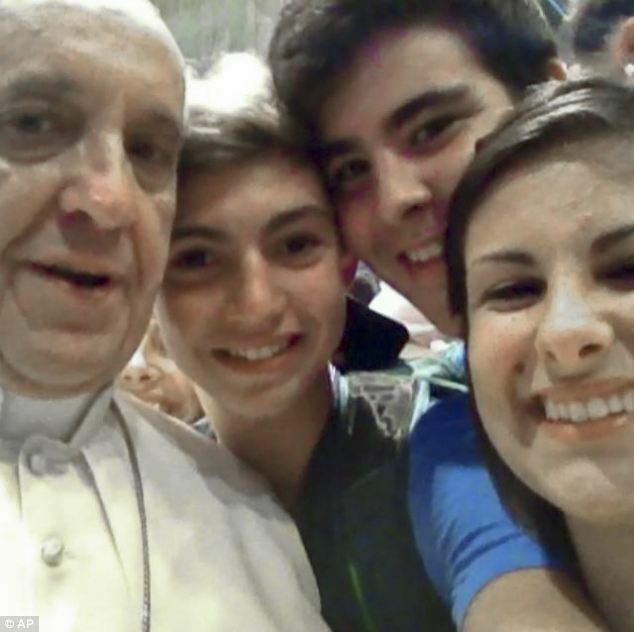 Has Pope Francis too been actively pursuing the development of his personality cult? Do popes need, or should they develop one? A personality cult, that is? Many people still wonder whether, behind that lovely smile of Pope Francis, we will discover a conservative or a progressive leader. What happened yesterday can be a message from the pope, in as much as that selfie, which was published by the Vatican’s l’Osservatore Romano. In fact one might tend to question, as Time did: Public Service or Propaganda? No harm, if by building Pope Francis’s persona, the church can reinforce its own voice. I feel that the church is very aware that, like every modern government, it needs to engage people. The church knows that its citizens are not only its followers but also the rest of the world. It is reassuring to note Pope Francis’s interest in interfaith dialogue for example – diluting divisions. Would the energy otherwise spent arguing differences, not be better committed to promoting the co-development of the twenty-first century. Update: Upon feedback from readers, the original final argument regarding the environment will be developed further in a future post. BBC yesterday used the above image of Kim Jong-un, northern Korea’s supreme leader. The post on BBC’s magazine monitor is funny as it exposes Kim’s obsession about being important, much like his grandfather. In the fifties, grandpa Kim Il-sung would issue on-spot guidance and his people would take notes, then execute it. 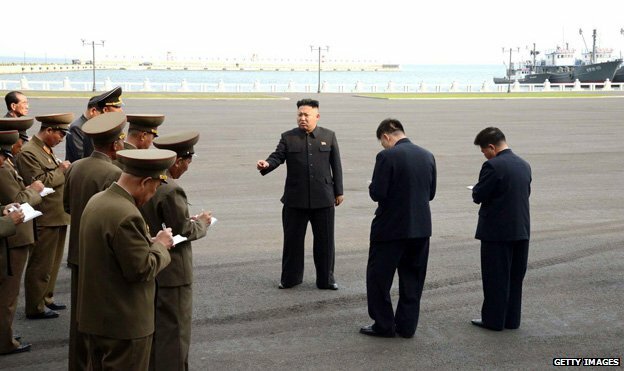 BBC’s reporter makes fun of people around the young Kim still doing so today, all on identical notepads. True, maybe they need iPads. But that point only just barely scratches the surface. What Kim Jong-un is up to is building his personality cult. Very little was done for him by his father, although Jong-un had been declared successor already two years prior to his father’s demise. In modern times, and specifically in Communist nations, the art of building a personality cult was maybe best conducted by Stalin. Others too have used means of mass communication to popularise themselves extensively. But none have been reprimanded so heavily as Stalin by Krushchev. In fact, in Kruschev’s address to the 20th Party Congress, we find repudiation not only to Stalin building a personality cult, but to a whole array of grievances to Marxist teachings. This includes repression of the collective leadership. Korea is under its third generation of Kim, and Jong-un’s father: Jong-il, had been cast as a deity. The official biography has his birth announced by a swallow and the event greeted by a double rainbow. The reporting of his death in 2011 has a fierce snow storm pause and the sky glow red. His word was final, and any deviation was considered as a sign of disloyalty. After his death, he was proclaimed Dae Wonsu (a title only afforded by Jung-un’s grandfather, and which means Grand Marshal). It is not the iPad in the hands of people taking notes which is missing, then. It is what the iPad represents in a modern society. The “i” stands for internet, individual, instruct, inform and inspire, said Steve Jobs in the 1998 launch of the iMac. All of these are powerful tools for a modern society which Jong-un can aspire to progress if he truly is to be the personality that his land needs in 2014. The policies of openness and transparency, termed Glasnost by Gorbachev, brought about the start of a collapse of a frightful era for Europe and the world. That process, more than twenty-five years later, is still ongoing. Is Kim ready? Pardon is a virtue, maybe only second to patience. And many times pardon requires patience. So was it for Balal, whose pardon arrived just a moment before the chair on which he was standing already, with a noose around his neck, would be swung from under his feet. At this very last minute the victim’s mum slapped him, and then forgave him, thus saving his life. Thankfully the slap did not itself swing Balal off that chair. For the picture below says it all. Death by hanging was his punishment for having killed the woman’s son in a fight, when both were just 17 years of age. Source: Iranian Students News Agency (ISNA). 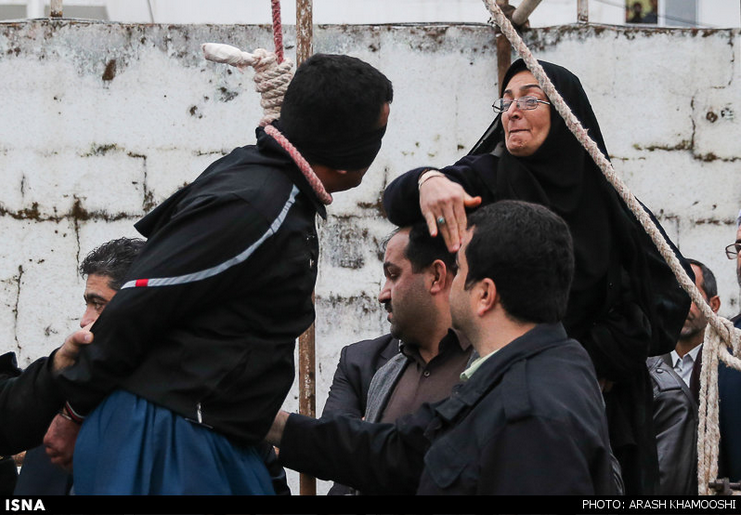 All photos of the moment of the interrupted execution area available here. Yesterday’s post about Stanfield’s momentous photo of just after the heart transplant surgery, was to say that photos have a story. This set of photos of Balal’s interrupted execution also have a story – many stories in fact. The story of Balal’s lucky strike for example, the one of the sadness of that victim’s mother, the one of public execution in general and of Iran where it is still practiced, and many others. What social media has enabled in the last ten years of Facebook, is in fact not just a social network, but many stories which would otherwise have been left untold. Facebook and other social platforms are a fountain of that imagination that fires to pull out a story for a picture you see for the first time. As the details and the motivation are unknown, you make them up. The anxious eyes of Religa monitor an instrument with data about the patient next to him. The patient has just gone a heart transplant. Outdated equipment drapes the patient. A staff member who has assisted Religa through the 24 hour marathon, is sprawled in the corner, gaining some rest. “Each of these elements,” says Stanfield, “gives dimension and drama to the photograph, while helping tell a story.” Each of these elements, Roland Barthes would say, contribute to the multi-dimensional space of the story, left to be disentangled only by the person viewing the photo. Stanfield’s perspective does not die (as in ‘Death of the Author’) after the photo is published, but it becomes one of the interpretations. Maybe, a story of the sadness of the desolate state of that operating theatre. Everything about photos has changed since 1987. Good story-telling photos are everywhere now, and if you’re taking them, iStockphoto.com is helping you sell them. And even if that doesn’t make every person who buys an SLR a Stanfield, Facebook is open for anybody who wants to tell a story. Instagram’s homepage boasts the slogan “Capture and Share the World’s Moments”, pretty ambitious for a website, but then that’s why Facebook acquired it for a billion dollars! Thanks to Ania, today, I met Nowness. For over two years now they publish innovative, fresh and original digital content which respects the needs of the online world. To the point and simple to read. Short words wherever possible. And in the active voice. They deserve a mention in my blog for this, and also for a lovely snippet about Malta and Gozo. I love it. Read A Maltese Affair. Almost a year ago, they also published a truly well-made short documentary about Strait Street in Valletta. The Director, Wiz, also uses authentic footage from when British soldiers flocked to this street after disembarking from the warships. Bars, liqueur, girls and brawls. This past and today’s reality make WIZ: Strait Street a must see. This page on designly‘s website inspired me. It’s called ‘one second‘, and that’s as long as it took me to decide to link to it. To my followers, I apologise, because I haven’t been able to post for a while. A whole jungle of things happened, and I have not been writing about digital stuff for a while. I still write about other things, but the material is not publishable yet. Meanwhile, feel free to stay in touch with good stories, questions and anything interesting. Content is King. Can Mobile Data Save the Music and Film Industries? Chasing our present, asking it to help us change our future, is not going to help. Instead, the best way to predict the future is to create it. I just finished reading the book called Who Moved My Cheese: An Amazing Way to Deal with Change in Your Work and in Your Life . It’s an old tale, beautifully narrated by Spencer Johnson – one which has helped millions around the world. Can it help the mobile industry as well maybe… the one who is losing 23 billion USD to the creators of Whatsapp and the likes? Mobile phone companies cannot survive the next 10 years by just selling 2-year contracts, minutes and SMS. But from my position as a customer, I see them dead set on a loosing strategy. Let me take SMS as an example, and here’s what I think makes Whatsapp an unbeatable competitor to SMS: 1) it’s reliable and you know when the recipient has read your message, 2) you can easily converse with multiple recipients independent of what device they have, and 3) it integrates easily with your address book. If everybody had an iPhone, only iMessage would be better! So sorry telcos… you won’t be beating this. Look elsewhere. Remember Blockbuster? In 1994, it was purchased for 8.4 billion USD, calling for the acquirer Viacom’s chairman, Sumner Redstone, to call it a “global media colossus.” But it filed for bankruptcy in the United States in 2010. The most cited management mistake is its refusal in 2000 to acquire Netflix for just 50 million. Dish Networks acquired Blockbuster out bankruptcy in 2011, but finally admitted at the end of 2012 that it was scrapping its plans to turn it into a Netflix competitor. When it comes to music, according to IFPI, “digital” now accounts to above 30% of revenue. Yet the same report, shows that despite the growth of over 8% between 2010 and 2011, this did not compensate for the loss in physical sales, and that the music industry slumped 8.7% globally (to USD 10.2b). It all started with a fight against Napster. That battle was won in 2001, but the war is long condemned to being lost. The biggest enemy to the music and film industry is digital piracy. IFPI/Nielsen report that globally 28% of internet users regularly access unlicensed services. The rise in revenue from digital accounts for the music industry is however encouraging. A reversal may eventually materialise also for the film industry: last year, GIA (Global Industry Analysts) estimated that the value of the movie-rental industry will rise to 4.7 billion by 2017. But the whole point is why wait for the future to unfold when the mobile industry can be changing all of this, creating a bright future for itself and the arts? GfK reports that in 2012, phones accounted “for 17% of total time spent with the Internet across all devices, compared to 12% in 2011″. So shouldn’t this industry that’s loosing 23 billion USD a year to mobile texting applications, be investing sharply to build revenue from content and thus more time spent on the Internet? Spotify comes to mind – “Turn your phone into a magnificent music machine with our award-winning Spotify Mobile Apps for iPhone, Android, Symbian and Windows Phone. Stream from our full library, or go offline and listen to your playlists without data charges.” says their page. The biggest inconvenience to this is that digital rights laws don’t allow Spotify to offer this service without geographical limitations. At an investment from the telcos, of the total worth of the music and movie industries, everybody stands to benefit. Happier customers with cheap music and movies on-the-go. Telcos with a growing market propped by content which 13% of the global population spend their time on the Internet for. Music and film industries that can stop battling digital, and embrace it to the extent that it will be their main funding agent for years to come.